When many people think of Belize, the main things that come to mind might include the vibrancy of Belize City, the beaches of Ambergris Caye or the unbeatable climate. However, few nonresidents know that Belize is actually made up of six unique and varied districts, each of which offers something special for visitors. Dive into the six Belize districts and learn more about each. Since it is home to Belize City, the busiest and largest urban area in the entire country, it should come as no surprise that Belize district is also the hub of politics, commerce and transport in the nation of Belize. Aside from Belize City, this district is home to islands like Ambergris Caye, the Altun Ha Mayan Ruins and beautiful sanctuaries for native animals. 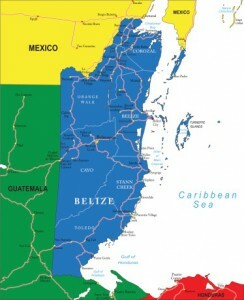 The southernmost district in Belize is Toledo, which shares a border and many cultural similarities with the neighboring country of Guatemala. The district boasts lush rainforests, traditional Garifuna villages, stunning waterfalls and the vibrant city of Punta Gorda, a great destination for those who want to get off the beaten track. Bordering Mexico in Northern Belize is the Orange Walk district. Although Orange Walk is just an hour by car from Belize City, it serves as a getaway spot that feels a lot more rural. The two biggest reasons to visit Orange Walk are the food and the history. Try the local specialties like salbutes and barbecued chicken from street vendors in Orange Walk Town, and then head to the ancient Mayan ruins of Lamanai. To take a boat to Honduras or access a secluded reef island, the district of Stann Creek is perfect. Located on the Caribbean coastline of Belize, Stann Creek offers Eco-friendly attractions like caves, beaches, nature preserves and hiking trails. Cayo is the only landlocked district in all of Belize, but it makes up for a lack of coastline by offering unparalleled adventure. Adrenaline junkies will love Cayo thanks to the opportunities for spelunking through underground cave systems, exploring ancient and crowd-free ruins at Benque Viejo del Carmen or even staying overnight in rustic yet romantic jungle lodges. In the very north of Belize, just a few minutes from Mexico, is the district of Corozal. This district is quieter and more relaxed, making it a great place for recreation and peace. The top attractions in Corozal include a butterfly farm, Mayan ruins, affordable dining and souvenir shopping in Corozal Town, and opportunities for boat tours from the coast. Each of the six Belize districts is scenic, inviting and home to some amazing attractions that are absolutely worth a visit. Click here to get more information on the best things to do in each of the six districts.